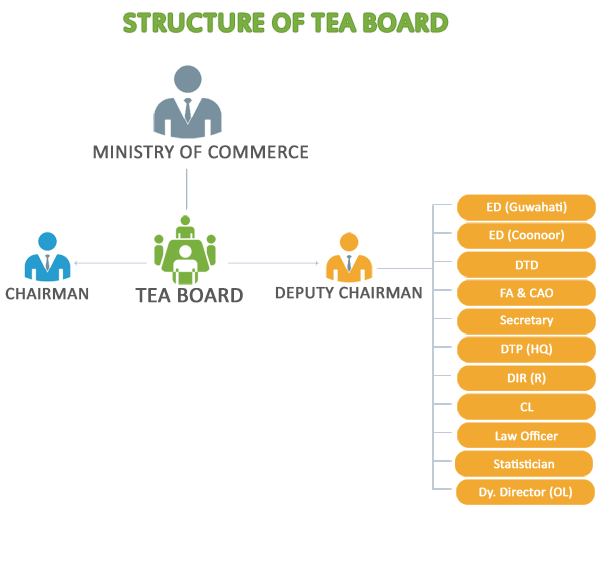 Organisation of the Board: The present Tea Board is functioning as a statutory body of the Central Government under the Ministry of Commerce. The Board is constituted of 31 members (including Chairman) drawn from Members of Parliament, tea producers, tea traders, tea brokers, consumers, and representatives of Governments from the principal tea producing states, and trade unions .The Board is reconstituted every three years. The Executive Committee deals with the administrative matters of the Board. The Export Promotion Committee deals with the work in relation to the export promotion of tea. Labour Welfare Committee guides the Board in implementation of various welfare schemes for the benefit of the plantation workers and their wards. The Development Committee is responsible for overseeing the various developmental schemes run by the Board. Licensing Committee for North and South India will act as per direction of the Board or the Executive Committee pertaining to Chapter III & IV of the Tea Act relating to Tea Estate of North India and South India respectively. Administrative Set-up: The functional activities of the Board's Head Office located in Kolkata, West Bengal are as under : The Secretariat headed by Secretary looks after Establishment / administrative works and co-ordinates with the various departments of the Board’s office. The Establishment branch headed by Assistant Secretary looks after administrative / policy matter and deal with the staff matter of the Board’s office. c) The Finance wing headed by Financial Advisor and Chief Accounts Officer is responsible for the maintenance of accounts, release of financial assistance to tea gardens and internal audit. d) The Development Directorate headed by the Director of Tea Development is responsible for formulation and implementation of various developmental schemes and rendering assistance to the industry in the procurement, distribution and movement of essential inputs. e) The Promotion Directorate headed by the Director of Tea Promotion looks after the works relating to Marketing and Promotion of tea in India and abroad. f) The Research Directorate headed by the Director of Research is responsible for co-ordination of tea research carried out by the different tea research institutions in the country and monitoring the functions the Tea Board's own Research Station. g) The Licensing Department headed by the Controller of licensing is responsible for issue of business licenses for tea exporters and distributors, recording the ownership of all tea gardens in India and implementation of the Tea Waste (control) Order and Tea Warehousing (control) Order. h) The Labour Welfare Department headed by Welfare Liaison Officer(North) looks after the work relating to implementation of welfare schemes of the Board. i) The Statistics Department headed by the Statistician is responsible for the collection of Statistics relating to tea area production, tea prices, export, import, labour and all other related data and carrying out techno-economic surveys of various tea growing areas in the country including cost studies. j) The Law Cell headed by Law Officer looks after all legal matters arising in various functional departments mentioned above. k) Hindi Cell headed by the Deputy Director(Hindi) is responsible for the implementation of the provisions of Official Languages Act and various related measures. a) Rendering financial and technical assistance for cultivation, manufacture and marketing of tea. c) Aiding Research and Development activities for augmentation of tea production and improvement of tea quality. d) Extend financial assistance in a limited way to the plantation workers and their wards through labour welfare schemes. e) To encourage and assist both financially and technically the unorganised small growers sector. g) Such other activities as are assigned from time to time by the Central Government. 4. Funds for the aforesaid functions are made available to the Board by the Government through Plan and Non-Plan Budgetary allocations. The Plan funds are being used exclusively for the activities mentioned at (a) above. Funds for all other activities mentioned above (F and g) are met from Non-Plan Budget allocation for which cess levied on tea is the major source. Tea Cess is levied on all teas produced in India under Section 25(1) of the Tea Act, 1953. The said Act provides for levying cess upto 50 paise per kilogram of tea produced in India. Currently, however, the cess is collected at the rate of 30 paise per kg. excepting Darjeeling teas for which only 12 paise is levied. The Cess at present is collected by the Central Excise Department and credited to the Consolidated Fund of India after deducting the expenses of collection. Funds are released by the Central Government in favour of Tea Board from time to time on the basis of the sanctioned budget after due appropriation by the Parliament. Such funds received by the Board are being utilised for meeting the non-plan expenditure. Plan Funds: Funds are provided under the plan budget with the prior approval of Planning Commission and EFC for implementing various developments, promotional and R& D schemes. Tea Board India Regional Office Palampur, Himachal Pradesh 176061. Kurseong - 734 203, Darjeeling. Veer Nariman Road, Mumbai - 400 020. It also maintains four Tea Bar/Buffets. (b) Foreign Offices: Currently Tea Board has two overseas offices located at Dubai, and Moscow. All these foreign offices of the Board are designed to undertake the various promotional measures to boost up export of Indian tea. These offices also act as a liaison office for interaction between importers of Indian tea of the respective regions as well as Indian Exporters.